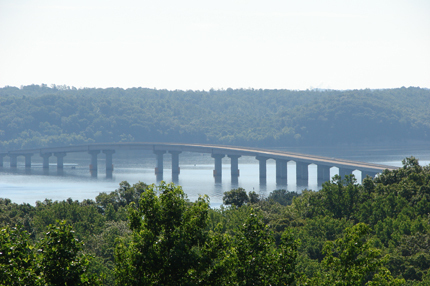 John Brady, editor of the second edition of 100 Best Retirement Towns, states that people like living in Paris, Tennessee because it has one of the largest manmade lakes in the world (Kentucky Lake), and people go there to fish and relax. Paris has a low cost of living compared with other retirement spots and the median sales price of a home in 2009 was well below $100,000. Come to Paris, Tennessee and let Lake Realty, LLC help you find your dream house, lakefront lot or any other type of property you are dreaming of. Let Paris, Tennessee be the place you settle down to relax and take pleasure in the beautiful things in life. A KENTUCKY LAKE PROPERTY IS WAITING FOR YOU! Welcome to Paris Landing, Kentucky Lake and to Lake Realty, LLC Online. We have put together an extensive list of Residential, Commercial, Resort, Farm/Acreage and Development Property for you to view. If you see something that you are interested in please feel free to call us toll free at 1-800-642-1981 or email us at: lakere@charter.net. Have a specific need but don't know the area? 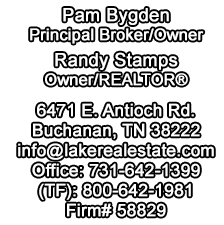 Check these listings and find your home at the lake or in town be it a vacation home or a full time residence. We will be glad to help you with anything you find, just call toll free or eMail us. You can also check out area listings on: www.tnvalleyrealtors.net. At Kentucky Lake, Paris Landing, Tennessee. Located on the shores of Kentucky Lake, this beautiful 841 acre state park includes outdoor activity for the whole family, including golf. A modern convention center within strolling distance of the renovated lodge hosts a multitude of shows and activities. Our Paris Landing area is growing, with features you will enjoy such as a log style motel Fish Tale Lodge, an American Heritage Museum that will take you back to "the good old days," and our championship golf course, The Tennessean. Another great feature in our area is our close proximity to The Land Between the Lakes National Recreation Area. Located just across Kentucky Lake from the north side of Paris Landing State Park area, easy access to the South Welcome area. Whether you come to camp, hunt, fish, boat, hike, look at wildlife, visit the nature station-homeplace- elk and bison prairie-planetarium and observatory, remember to bring your camera.